Last weekend I competed at the USATF Masters Indoor Track and Field Championships. I took home a couple of medals but mostly it was an exercise in humility! 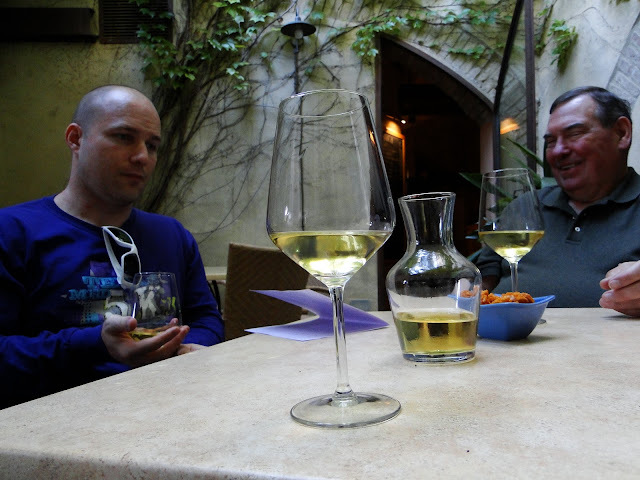 It was great fun, I made some excellent friends, and I left feeling incredibly invigorated. My journey to the nationals began last Summer. As I have blogged about before, I participate in the annual summer track meets hosted by Carolina Godiva Track Club. These are informal events with participants ranging from 8 to 80 years in age. I have never trained for them and have mostly viewed them as a fun, social way to get in some speed work for my distance running. Last year, though, my world was rocked at one of these events when a 60-year-old woman named Becky lined up next to me in the 100m dash and ran neck and neck with me the entire way - wow, I was impressed! It turns out that she was the US national 100m champion in the women's 60-64 age division. Between her, Louise (78 years old), and William (77) - all of whom came out to some of the summer track meets - I was thoroughly inspired. Although I have never run track competitively, I spent the first half of my life as a sprinter of sorts on the football field. I carry around a lot of muscle that does me no good in long distance but helps me generate power in a sprint. Whether for these reasons or for the reason that I've just been getting kind of bored training for the same 5-10k distance races for the last 15 years, the inspiration I felt from Becky, Louise, and William motivated me to make a change. In August of last year, I shifted gears and began training as a sprinter. Another friend from summer track nights, Cindy, took me under her wing and helped me get started. As a world class track and field athlete, she helped me ramp up quickly in this new world. Her husband, Dante (an Olympic-caliber 400m runner himself), helped and supported too. It was hard to make consistent improvement throughout the Fall, though, as I was traveling a great deal and getting sick every other week as our son brought home various bugs from the petri dish that is daycare. I ran two "test" track meets, one in October and one in January. The results weren't great and, due to my inconsistent training, I wasn't showing much progress. 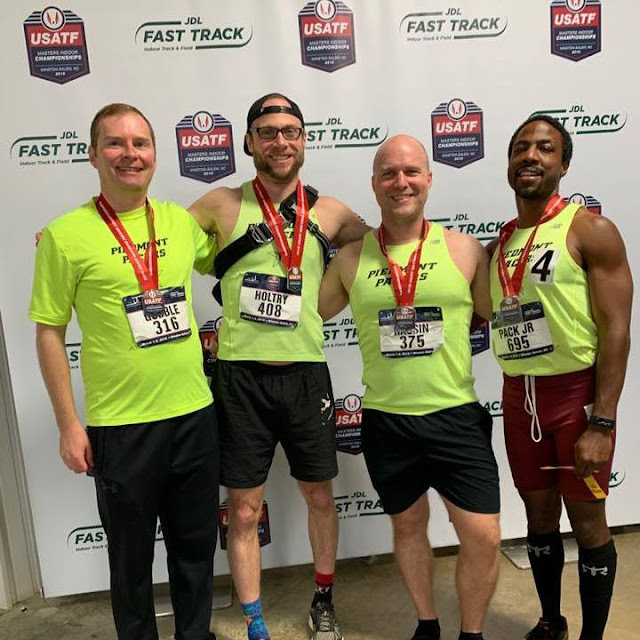 I recognized several friends at the January meet, though, and they encouraged me to join the Piedmont Pacers, a local track club that competes together as a team at these types of events. Joining the Pacers really marked a turning point in my training. At least once a week I began joining a team practice with other Pacers. Louise, who turned out to be a Pacer, brought along her teammate, Angela. Rick, a very fast sprinter and middle distance runner about my age - brought along his awesome wife, Ryan. Even Becky, who isn't a Pacer and lives hours away, would come join us when she would happen to be in town. Anyone who knows me at all, knows that I am 110% extrovert so turning training into a team event really supercharged my workouts. When March rolled around, it was time to see if the training had been paying off. To be clear, my times indicated that I wouldn't be terribly competitive. I was still new to track, still trying to remind my muscles how to fast-twitch, and, to boot, I would be the oldest competitor in the 35-39 age division - just three weeks shy of moving up to 40-44! However, I thought it would be good experience for me and I hoped to help the Pacers earn at least a few points, so I left my pride at the door and headed to Winston-Salem for three days of intense competition. On the first day of competition, I only had one event: the 400m. In January I had run a 1:08, which is substantially slower than my outdoor 400m times from the Summer. Because indoor tracks are shorter, requiring more time in tighter turns, I expect my times to be a little slower but I was hoping to bring my time down at least to 1:06. An even-ish race plan was to run a 32s split for the first lap and 34s for the second lap. Well, best laid plans! I went out way too fast, probably pulled along by my much-faster-than-I-am competitors. When I saw the clock at 30s as I finished my first lap (barely slower than my 200m PR), I knew I was in for a world of pain in the second. The rest of that race seemed interminable - all the more so because I was basically running by myself at that point - but I finally crossed the finish line in 1:06.66. It was an improvement but not quite what I had hoped for. I'll try to settle in and run my race next time. Dropping some excess weight will help too; I averaged 529W of power over the course of the race and that could propel a lighter version of myself much more quickly. Regardless, I have a long way to go; the winning time was 51.42! I had three events to run the second day, starting with the 60m. The 60 is a pure, all-out sprint so I had no strategy other than run as fast as I could. The start really matters in the 60 since it is such a short race. I'm still pretty new to starting out of blocks but I was hoping my recent practice would pay off. When the gun went off, my reaction time was good. I had violent arm swings and rapid step turnover. My top speed just isn't very good yet, though. My poor flexibility limits the range of each step and my competitors all pulled away as the race went on. I finished in 8.75, nearly two seconds slower than the winning 6.88. 8.75 was a new PR for me, so I'm pleased with the progress, but I have a lot of room for improvement. In addition to flexibility, I really need to work on explosive power for this race. I'm stepping out of my blocks rather than exploding out of them. After several hours of waiting around, my next event was the 4x800 with Matt (41 years old), Kevin (43), and Rick (38). A team's youngest member determines its age category so we were competing in the M35-39 division. Matt, who was battling a calf injury, started us off well with a 2:42 leg. I took the baton and ran a very uneven 2:47. My first lap was - surprise, surprise - way too fast so, after I passed two competitors, I settled down. I may have slowed down too much but it was hard to know my pace as I had taken the baton at an odd time and my brain was way too oxygen-deprived to do math! I averaged 432W on my leg. Kevin did better, running 2:46 with disturbingly even splits. Seriously, he might be a robot! Rick, our fastest runner, started off hot, running a 32s first lap. We could see that the first place team was way ahead of us and we had a commanding lead over the third place team, so we called out to Rick to slow down and save his juice for the next race. He wound up running a 2:33, putting us at 10:48, which was good enough for the silver medal - huzzah! No sooner had we finished the 4x800 than we had to line up for the 4x200. Our 4x200 team had the same members and we ran in the same order so at least our exhausted minds didn't have to think much. Matt ran a good 29s opening leg. He had to pass the baton to me in the outer lane on a curve, though, which was a bit of a challenge. I ran 30s (577W), as did Kevin after me, and then Rick brought home the anchor leg in 27s. Our final time was 1:56 but the competition was much stiffer in this race and we were only good enough for 4th. Having run the final heat of the final event of the day before, I was among the last competitors to leave the track. Naturally my first race the next day was early so . . . no rest for the weary! Because my projected time was the slowest (by far!) in my heat, I was assigned to lane 1, meaning I had to run the tightest turns. When the gun went off, I had another powerful start, but I had to bend that power around a tight curve - and then another one at the other end of the track. I finished in 29.25 (633W), an indoor track PR for me, but far behind my competition. The same notes apply: I have a lot of work to do to increase my top speed. Our team reunited to run the final heat of the final event of the track meet: the 4x400. We were tired and sore from days of competition but adrenaline pumped us up as we neared the starting line. The same teams who had beaten us soundly the day before were out there again but they were tired and sore too, so anything could happen. Matt again started us off well, hobbling through a 1:06 opening leg, maneuvering us into 4th place. I grabbed the baton and all soreness seemed to leave my legs. It's hard to tell from the race video, but it looks like a ran a PR 1:04 (553W) for my leg. I'm a team sports guy, not an individual sports guy. Put me out there with teammates depending on me and I will rise to the occasion. In the relays, other runners are spread more evenly around the track, motivating me to surge and pass them. Compare that to the individual events, during which the closest I ever was to the competition was when were at the starting line! Regardless of the mechanism, I ran a good time (for me) and passed two competitors to put us in 2nd. Kevin ran a strong 1:13 and then Rick brought us home with a smoking 58s anchor leg. Final result: 4:21, good enough for another silver medal! It was fun - a lot of fun! I didn't expect that. There were long stretches between my races when I intended to sneak away to a cafe to get some work done but staying and cheering for my friends as they competed kept me at the track. I loved being on a team; that made all the difference in the world, adding meaning to every race. The Pacers finished 7th in the team points competition and I was proud to have helped contribute 15 of those points through our relay performances. Being part of a team also gave me more people to cheer for throughout the meet. I wonder how "valid" the results of the competition are. It's neat to receive a silver medal and claim that our team earned #2 in the nation but we were really only #2 of those present at the meet. How many faster teams might be out there who didn't have the time, money, or other wherewithal to travel across the country to compete? This point isn't very important to me since I'm really not in it for the medals, but it did make me wonder. What I will remember most about this meet is the friendliness and supportiveness of all of the competitors. Before each race, competitors shook hands and wished each other luck. Between races, I met and made fast friends with competitors from all over the country and with very diverse backgrounds. Kudos to the USATF and JDL Fast Track for cultivating such a culture of positive sportsmanship - that is, after all, what sports are all about! 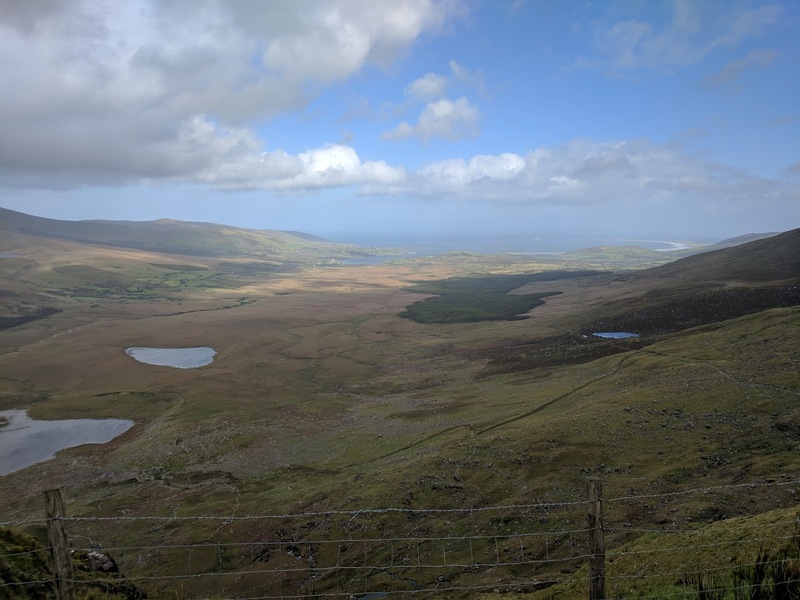 On Day 6 in Ireland we ventured into County Kerry, heading toward the coastal village of Dingle. However, as with many things in life, the journey is just as important as the destination! We stopped for gas at a normal-seeming gas station but it turned out to have an amazing bakery inside! So we continued our drive loaded down with donuts, muffins, and breakfast cakes! En route to Dingle, we traversed Conor Pass, a high mountain pass from which you can see forever East and West. There was a gorgeous waterfall and amazing vistas in both directions. We parked the car and tried to hike up to the highest part for the best view. This was more difficult than anticipated because the sheep that graze these mountains leave poop all over the place and trying to avoid it made us hop around like Qbert! Still, despite that obstacle - and the blustery wind - it was well worth it for the panoramas. We finally arrived at Dingle, a charming little harbor village. It was bounded on all sides by rolling green hills so it felt very much like the Shire! After walking a big loop around the village, we stopped for a pint at Murphy's Pub. This was the only time all trip I didn't have Guinness. Instead, I drank . . . Murphy's! Before departing, we also took the tour at Dingle Distillery for some "new school" Irish spirits. En route to the place we would be spending the night, we had to stop for a herd of cattle crossing the road. Cattle in County Kerry? I guess they were the source of all that awesome, grass-fed Kerrygold butter we eat! They seemed very happy - and not at all in a hurry to move out of our way! Around sunset we finally arrived at Carrauntoohil Eco Farm near Killarney. This was a really cool farm with goats, chickens, cats, and alpaca, offering several yurts and one "cabin" for overnight guests. Katie and I opted for the cabin but it turned out to be just about as rugged as the yurts - basically a small storage container with a bed and some electric outlets! It was fine for our purposes, though so no complaints. Carrauntoohil was not merely a farm, though; it was an ecofarm, which meant that it recycled rainwater (of which we had a true deluge that night! ), used dynamic, organic farming practices, and . . . used compost instead of toilets with plumbing. That's right, I was far away from my fancy, heated toilet seat with built-in bidet; instead I was just sitting on a hole in the ground with a polite reminder to sprinkle sawdust down the hole after I was done! Actually it wouldn't have been so bad if it hadn't been for the enormous spiders that occupied the outhouse . . .
For dinner that night we trekked into town to Kate Kearney's Cottage. It was a total tourist trap but was good all the same. After dinner there began live music and dancing but the real treat was hearing Danny Boy played on bagpipes. For a tourist trap, you could do much worse. We settled in for the night back at the Eco Farm and woke up the following morning to mountains completely shrouded in fog. Whether looking out over vistas spanning miles and miles or ensconced in fog so thick you can barely see the Sun, this country is just so beautiful! Today we celebrated the life of a great man. Paul Farmer was a patriot, a public servant, a coach, a husband, a father, and a grandfather. A graduate of the US Naval Academy, where he was a multi-sport athlete, he spent his military career as an aviator in the US Marine Corps. During a training exercise in the 1970s, he was forced to eject from his aircraft. Despite his parachute failing to open, he managed to land on his feet, breaking his back but saving his life. During his hospital recovery, he began courting one of the nurses, Kathy, who soon became Mrs. Farmer. They were married 46 years before Paul died, and during the last 26 of those years, they played a very significant role in my life. I learned a great deal from him about sports, food, wine, and life. Paul was laid to rest this morning with full military honors at Arlington National Cemetery. It was a very moving ceremony with scores of troops, a full Marine Corps band, and, of course, a 21-gun salute. The reception at the Navy Officers Club on base was a real joy. A plurality of Paul's Academy company-mates joined us, as did many of his colleagues, and the stories shared were truly worthy of the exceptional life we were celebrating. So I’ve spent the vast majority of my life calling Paul Farmer “Dad II” but, when I first met him, I called him "Coach." To paraphrase a movie from around that time that Nick and I both loved, Coach is the name for God in the lips and hearts of young boys. Indeed, as most of us didn’t have a shot at playing professional baseball, our coach’s primary responsibility wasn’t to develop us into top prospects; it was to help us develop into young men. Coach Farmer took to that responsibility like a fish to water - not by sitting us down and saying, "Here's how to be a man," but rather by example - and what an example he was: a world-traveled, meat-eating, wine connoisseur, fighter pilot, athlete - what a man! But you never would have known most of that as he didn't wear much on his sleeve. Mr. Farmer conducted himself with a quiet, determined humility, which is what he taught us on the field: keep your head down, work hard, do your best, and you will achieve your goals. This applied doubly so in the classroom as it did to the baseball field for Mr. Farmer was one of the smartest, most learned men I've ever known. I have fond memories of sitting around his table playing Trivial Pursuit. It wouldn’t have been much fun for him because he knew all the answers. Instead, he relegated himself to asking the questions and giving us clues that were so clever, they could only really be appreciated once the answer was known. And yes, I include in my list of examples of Mr. Farmer’s intellectual prowess another of my favorite memories: the time he was summarily ejected from one of our baseball games he was coaching for arguing with the umpire. As soon as we returned home, we looked up the rules and, of course, Coach Farmer was right - he was always right. While that memory stands out to me because it may be the only time I ever witnessed Mr. Farmer, the consummate officer and gentleman, really get riled up, he wasn't arguing with the umpire because he wanted to win; he was doing so because had strong convictions about what is right. You don't do something to gain some reward or to avoid some penalty; you do it because it is right. That strong sense of conviction and duty made Dad II one of the most gallant men I have ever known - a true modern day knight. When my Mom I was seriously ill in the hospital, Paul and Kathy visited her regularly and helped her get better. When my wife and I suffered a devastating pregnancy loss, Dad II was among the first to send us the sweetest, most heartfelt note of condolences. On the surface he could be stoic and reserved, but underneath was a tender heart and a man who was incredibly thoughtful. They say with icebergs you only see the 10% that's above water but the 90% below is what’s really powerful. I find that describes Dad II very well - all the more so because his aviator call sign was Penguin! You were one of a kind, Paul Farmer, the best of the best. The Force was strong with you in life and it is even stronger with you in death. You leave behind a legacy of a country that thanks you, friends and colleagues who respect you, and a family that loves you. You live on in all of us who remember you and through your lessons which we are now passing on to the next generation. I'd like to send him off with a slightly adapted poem, the subject of which was near and dear to Paul's heart since practically the day he was born. Oh somewhere in this favored land, the sun is shining bright. A band is playing somewhere, and somewhere hearts are light. Somewhere men are laughing, somewhere children roam. But there is no joy in Mudville, for Paul Farmer has gone home.